1. Common Summative Examination is scheduled from 14-3-2017 to 27-3-2017. 2. Remedial Teaching Programme is scheduled from 28-3-2017 to 22-4-2017. 3. 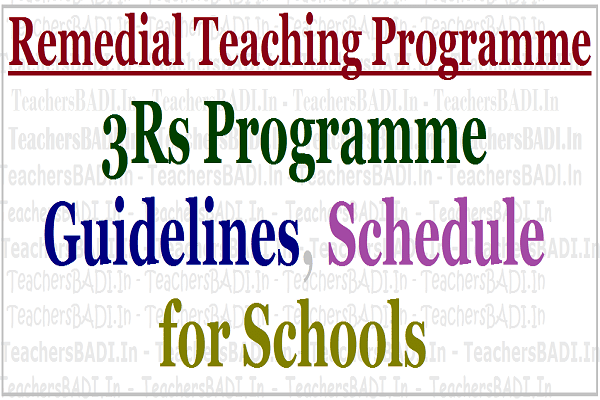 Remedial Teaching Programme is meant for the Dl, D2 grade students of classes I - IX. 4. Remedial Teaching Material - Teacher Handbook and Students Workbook - will be supply to all DEOs in the form of soft copy and the same is placed in SCERT website. 5. Student workbooks may be supply to all the students after finalization of funds pooling for Printing. 6. DEOs take initiation to conduct Remedial Teaching Programme for the benefit of slow learners to enhance their learning levels. 7. Conduct training programme to all the Headmasters on modalities of Remedial Teaching Programme. 8. Remedial Teaching is a 200 hours programme which will be completed in 100 working days. This will be implemented in two spells for three subjects i.e., Telugu, English and Mathematics. Spell - I Remedial Teaching period is morning session and all the schools works from 8.00 am to 12.30 noon. So we have four and half working hours per day. The 412 working hours per day will be divided into 3 sessions. Remedial teaching in the subjects of Telugu, Mathematics and English @ 1 1/2 hours per subject. Nearly 27 working hours are available per subject. 18 working days are available for Remedial teaching from 28-03-2017 to 22-04-2017. Nearly 27 working hours are available per each subject. The second spell of 100 days Remedial teaching programme will be continue after re opening of the schools for the next Academic Year i.e., 13-06-2017. 11. During summer: During summer Mid-Day-Meal (MDM) will be provided to the students in the drought mandal schools. Spell-II of the Remedial Teaching will be continued during summer in these schools. Remedial Teaching classes should be conduct in the morning session before MDM. 12. Constitute Divisional Level Committees in their respective districts with DIET Principal, DIET Lecturers, SSA, RMSA Sectoral Officers, Dy.EOs, MEOs to monitor Remedial Teaching Programme. 13. During Remedial Teaching Programme instruct all the teachers to implement readiness programme for other than D2 grade students. 14. Readiness Programme is based on the required competencies of the forth coming class. 15. Readiness Programme material is also prepared the SCERT which will be disseminated to all the DEOs and the same will be placed on the SCERT website.